SSP-067: Detailed boot tutorial for Kaye Wiggs and A Girl for all Time. So Raccoon HQ presents this lovely and highly detailed tutorial on how to make UGG boots. there are even some stockings, for protecting your doll from any potential staining from dark or deep-dyed boot fabric. *Etsy will charge EU customers VAT (This does not affect America or other non-EU countries). EU customers might find it cheaper to buy here, directly on the blog. Once your have paid, I will email your digital pattern file directly, within 24 hours at the outside, usually much sooner. I've seen many tutorials in my dolly internet travels, and I found a lot of them a bit lacking, so I've made this really detailed, to walk even a novice through the process. There are of course pattern/template pieces for two sizes of boot and three sizes of stocking. The stockings have three options for stocking tops, including an anti-slip pair. If your Tobi is anything like mine, she'll be very slippy in the legs, so this technique is invaluable for good stay-up stockings for her. The Kaye Wiggs MSD UGGs also fit A Girl for all Time dolls, and AGAT also has her very own stocking template. Boots are such fun to make, I have a pile of them on my desk, and a bag full of different colours of fleece all ready to go. These boots don't need a separate sole. My girls stand perfectly in boots with just the plain fabric sole. But if you want to add a firmer sole, there are instructions for doing just that. So next, I'll be working on the fleecy lace-up boots, and hopefully producing a tutorial for those. Then I want to make boots for my Iplehouse JID girls, and hopefully even Little darling. The smaller the doll's feet get, the more fiddly the boot, but I'll take them down in size to fit a few more dollies. These are pretty in pink. Another experiment. I'm playing around with the fleece and have tried bonding it to fabric for the soles in these boots. Also, if you want to make a relatively easy pair, you don't really need to do all the eyelets. Simply running some cotton embroidery thread through the fabric with a large needle works quite nicely. The laced-up one is sorta finished, despite needing nicer laces. Green is used here for contrasts, so it shows up in the photo well. I might glue some craft foam to the soles to finish them off. The other one still needs trimming and lacing. They're on the lasts at the moment. Can't wait to try them on the doll. These are taller than the desert boots, and I've tweaked the pattern, trying to get a nice toe shape. I've discovered the secret, but it's mine. All mine. Mwuhaha. You might think the sewn through laces are annoying when it comes to removing the boots; but because of the stretch in the fleece, it's actually fairly quick and easy. The pen marks are Pilot Frixion pen. Ironing the shoes is pointless, but a just quick burst of steam removes the ink completely. I scribble all over my garments making tailors marks, and love that the pens I use completely disappear. And here are yesterday's desert boots, on my sunkissed Missy. Have ordered different colours in fleece too. I really .. honestly. I wish I could stop buying fabric. Moar Shooz. For Kaye Wiggs and A Girl for all Time. I've posted some of these on Facebook, but here are what I call the holy grail of shoe projects. I've long wanted to make my own lace-up boots, and finally, having drafted a pattern entirely on my own, I've found the perfect fabric to use for MSD size doll shoes. It is very easy to 'ease' the pieces together whilst sewing. It doesn't need a hem. Yay. It's stretchy, so one pair of shoes or boots will easily slip onto the doll, and will probably even fit more than one of your different dolls. These are modelled by my KW MSD Missy. Alas, they don't fit A Girl for All Time dolls. AGAT's feet are too wide. But that doesn't mean I won't make her a pair. And the UGGs I posted yesterday on FB. These do actually fit AGAT perfectly. I did the seams on the inside, but Myself and everyone who expressed an opinion preferred the seams on the outside. More like real UGGs. But they're still quite nice. Here's the single prototype boot. I need to make another to match, seeing as how perfect this one turned out. I have a few colours of fleece, so may spend a few days just playing with boot ideas. 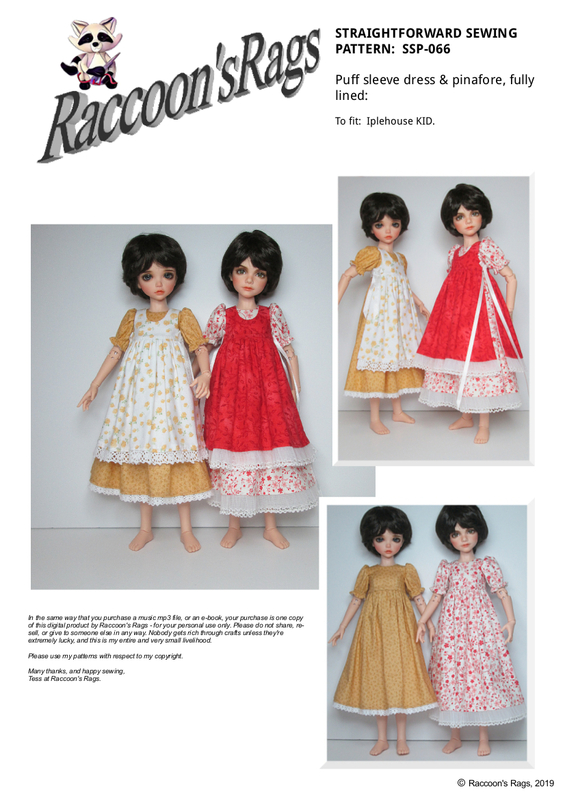 Three new outfits: Kaye Wiggs mini, and Iplehouse KID. Here are the little outfits resulting from my latest sewing pattern. I love the flopsy pinafore and bonnet look on dolls. Very Holly Hobbie. In my Etsy shop: This link will take you to my Handmade Doll Fashions section. SSP-066: For Iplehouse KID. Puff sleeve dress and pinafore. My first pattern for Iplehouse KID! I picked an old favourite, seeing as I've been revisiting it to fit Mini Kaye Wiggs gals. My Lonnie and Paige look adorable in these outfits. The dresses on their own. The pinafore is open at the sides. you can use ribbon for the mock ties, but the instructions on how to sew fabric mock-ties are very clear. And the pinafore can be made with skirt backs, or no skirt backs, as a sort of apron-style garment. There are also tips on page 20 on how to make a sleeveless dress.